Industrial matting is an extremely tough and durable, it provides superior qualities of slip resistant, foot and leg anti-fatigue and versatility, Perfect for applications such as industrial flooring, truck and ute matting barbell flooring, mud flaps, to name a few. Manufactured in 1.2m x 10m Rolls in a range of thickness to suit every application 3mm, 5mm, 8mm, and 10mm. The rolls are available in 800kg/m3 and 1000kg/m3 densities. The 800 series is used in less extreme applications whilst the 1000 series is suitable for heavy use applications. The 800 series is permeable and the 1000 series is only slightly permeable both made from polymerically bound recycled rubber. For applications requiring adhesion to the sub straight we recommend sikaflex polyurethane adhesives. 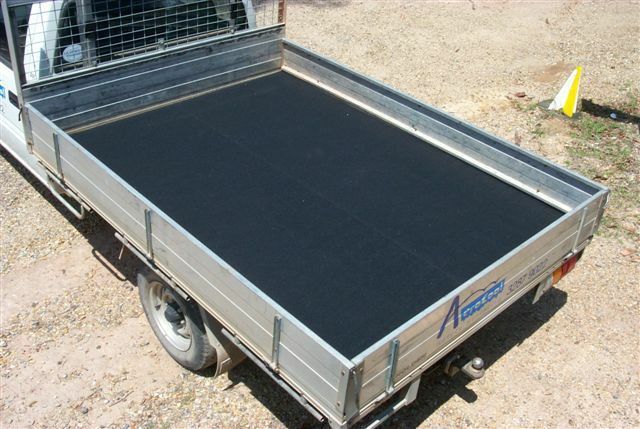 Our custom made mats are hand made to you requirements, they are developed to reduce damage to vehicles and goods. Available in a range of standard sizes or we can custom make to suit your vehicle or special requirement. Repeat Rubber Cargo Protection is made from the best rubber on the planet?car tyres. The friction properties of this rubber when formed into sheets can reduce restraint requirements. Protecting your product is easy with its cushioning qualities. Repeat Rubber Cargo Protection is being used in the transport of windscreens, paper, plastic, steel, pipes, slabs and timber.